A country of vibrant festivals, gorgeous coast reefs, powder white-sand beaches and lush rainforests. 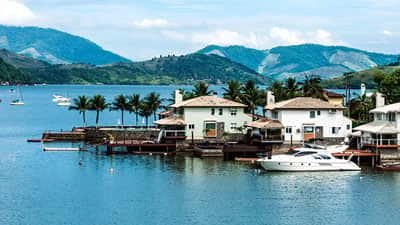 In southwest Rio de Janeiro, explore the vast bay of Angra dos Reis with more than 300 beautiful islands and 2,000 beaches. Swim around the floating bars and restaurants in the little-frequented paradise, Dentist’s Beach. 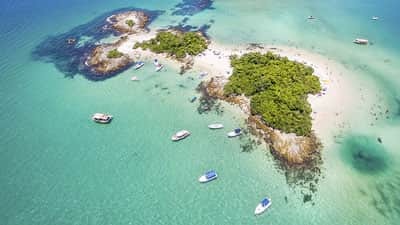 A popular getaway for Rio residents, the islands of Angra dos Reis offer many attractions and adventures including scuba diving the surrounding coastal reef or the Aquidaba shipwreck in Jacuecanga Cove. Ilha Grande, the largest island of the region, is one of the best diving spots in Brazil with colourful reef and rich marine life. A true nature lover’s paradise, Ilha Grande is regarded as one of the 7 Wonders of Rio de Janeiro and is home to some of the best-preserved beaches in Brazil. Relax on the fine, sugar white sand of Lopes Mendes beach, voted one of the top 10 most beautiful beaches in the world by Vogue Magazine. If you enjoy hiking, the trek up Pico do Papagaio is the highest peak on the island and worth the amazing panoramic views of the surrounding islands. Near Ilh Grande, anchor across the bay from the pretty historic town of Paraty. A charming city with cobblestone streets, old colonial houses, mouth-watering restaurants and outstanding natural beauty, Paraty is a place where the rest of the world fades away. 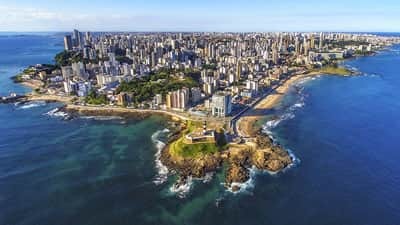 Dine on local seafood, explore the trails and beaches of Enseada de Palmas, visit the chapel of Freguesia do Santana or go snorkelling in the cool green waters of Lagoa Verde. The best time to visit Brazil is from April to June, and July through September for the Amazon rainforest. Avoid the heat and crowds of mid-December through March.